Obstructive ureteral disease is a very frustrating problem in feline medicine. Causes of ureteral obstruction include ureterolithiasis, ureteral strictures, dried solidiﬁed blood stones, mucus, and tumors. Ureteral obstructions cause an increase in pressure that is transmitted up to the kidneys which eventually can decrease and even stop the glomerular ﬁltration rate of that kidney. Treatment of ureteral obstructions can include medical management, surgical management and interventional management. The most common cause of ureteral obstructions in cats is ureterolithiasis. 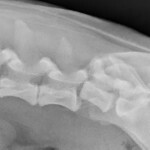 In cats with this condition, about 98% of the stones are calcium oxalate stones. These stones cannot be dissolved and must be removed. Ureteral strictures are being recognized as a more common cause of ureteral obstruction. Strictures may be due to previous ureterotomies, a congenital condition called circumcaval ureters, or the cause may be unknown. Circumcaval ureters are an embryological venous malformation resulting in displacement of the ureter dorsally to the vena cava. In humans, this signiﬁcantly increases the chance of development of hydronephrosis. Since this condition can only truly be noted during surgery or necropsy, we do not know how many of our patients are affected with this condition. Recent necropsy studies have documented an incidence of 14-35%. These are more likely seen associated with strictures in cats. Presentation of cats with ureteral obstruction varies signiﬁcantly. Some cats have partial ureteral obstructions found incidentally with no clinical signs, while other cats present to the hospital in critical condition. In a study of cats with ureteral calculi, the most common clinical signs were reduced appetite, vomiting, lethargy and weight loss. Other less common clinical signs can include polyuria/polydipsia, stranguria/pollakiuria, abdominal pain, inappropriate urination, hypersalivation or obtundation. Since these clinical signs are all generally non-speciﬁc, further work-up is always indicated to help rule out this condition. Physical exam ﬁndings in cats with ureteral obstructions are also varied and non-speciﬁc. If a cat has a unilateral ureteral obstruction, the clinician may note unilateral renomegaly and abdominal pain on palpation. Many cats with ureteral obstructions have a contralateral small kidney. This is thought to be associated with injury due to passage of stones previously, leading to ﬁbrosis, scarring and decreased glomerular ﬁltration rate. Clinicopathologic abnormalities likely include azotemia. However, even if there is a complete ureteral obstruction, azotemia may not be noted if the contralateral kidney still has full function. Other abnormalities that may be seen include anemia, hyperkalemia, and a neutrophilic leukocytosis. Ureteral obstruction is conﬁrmed by imaging. A combination of ultrasonography and radiography has been shown to increase the sensitivity for ﬁnding ureterolithiasis in cats to about 90% when performed by experienced radiologists. Radiographs are helpful for determining the number of stones, size of stones, distance of stones from the renal pelvis and ureterovesicular junction, and for evaluating the kidneys for nephrolithiasis. Typically on ultrasound, hydronephrosis and hydroureter are seen. If ureteroliths are present, they can be seen as a shadowing hyperechoic structure distal to a tortuous and dilated ureter. Hydronephrosis and hydroureter are generally easy to see, especially if they are severe. However, it should be noted that it can take days for hydronephrosis and hydroureter to occur after obstruction, so a lack of these ﬁndings should not rule out ureteral obstruction as a cause of azotemia. Ultrasound is also very operator and machine dependent. If suspicion for ureteral obstruction is high but cannot be documented via ultrasound or radiographs, further diagnostics may be indicated. Intravenous pyelography is not recommended since the decreased GFR of the obstructed kidney may lead to contrast retention within the parenchyma of the kidney. Antegrade pyelography is a procedure where a needle is inserted into the dilated renal pelvis and contrast is carefully instilled. This procedure eliminates the need for intravenous contrast and helps protect the kidney if additional imaging is necessary. Follow up radiographs or CT imaging may provide additional information about the obstruction. Ultimately recommendations for medical, surgical or interventional management of these conditions depends on each individual patient. Medical management of ureteral obstruction depends on the severity of the disease. In patients who are non-azotemic and only have partial obstructions, pain management and close monitoring may be all that is needed. However medical management has not been shown to be very successful at causing passage of ureteral stones. In a study of feline ureterolithiasis, only 17% of patients were reported to have movement of their stones with aggressive medical management. Medical management strategies are generally theoretic; there are not studies to show that one management strategy is more successful than another. As with all patients with acute azotemia, dehydration and electrolyte balance should be corrected. Caution should be taken with the rate of intravenous ﬂuids given, as it is very common for these patients to become ﬂuid overloaded with aggressive ﬂuid diuresis. Mannitol can be used as an osmotic diuretic to try to “push” the stone down through the ureter. This is a reasonable strategy as long as the cat is not volume overloaded. Mannitol is generally given as a continuous rate infusion for 24 hours. If there is no improvement after this period of time, the mannitol is discontinued. Other medical options include alpha-adrenergic antagonists such as Prazosin or the tricyclic anti-depressant amitriptyline. Glucagon is also another medical option for causing ureteral smooth muscle relaxation. See Table 1. When medical management is unsuccessful or the cat is severely affected, more aggressive treatment is required. If the patient is severely affected and too unstable for surgery, or if owners want to see how renal decompression alleviates azotemia, a percutaneous nephrostomy tube can be placed temporarily. 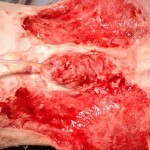 This is a quick procedure that can be done to help stabilize the patient prior to more intensive surgery. If there is a single ureterolith causing obstruction, a ureterotomy has been recommended in the past to alleviate the obstruction. Due to the small size of a cat ureter, these procedures are difﬁcult and have a signiﬁcant perioperative morbidity and mortality rate. In a retrospective study of cats with ureterolithiasis, major post-operative complications occurred in 31% of cats, resulting in death of 18% of cats. The most common complications after a ureterotomy include uroabdomen and persistent ureteral obstruction. Of the cats that survived, and for which follow up information was available, 14/35 (40%) had a second episode of ureterolithiasis. This may be due to predisposition to forming calcium oxalate stones, and this may also be in part due to stricture at the ureterotomy site. The high complication rate, and high rate of reobstruction of these cats make ureterotomy a difﬁcult procedure to recommend. The development of a ureteral stent sized for a cat has helped with management of cats with ureteral obstructions. A ureteral stent is a hollow tube that forms a curl at both the cranial and caudal aspects. Due to the small size of cats, ureteral stents need to be placed surgically. The goals for ureteral stenting are to divert urine from the renal pelvis to the urinary bladder, to encourage passive dilation of the ureter around the stent, to help urine pass next to the stent as well as through the stent, and to prevent migration of nephroliths down the ureter causing recurrent obstruction. This procedure is associated with less severe perioperative morbidity and mortality. In a study evaluating ureteral stenting for benign ureteral obstructions in cats, there were major complications in 9% of cats post-operatively, with uroabdomen being the most common complication. Interestingly, 17% of cats with a ureteral sent placed developed episodes of congestive heart failure, even though some of them had echocardiograms performed prior to surgery that did not show any structural heart disease. Although short term morbidity and mortality appear improved, one-third of cats in this study had long term complications related to the stent. Nineteen percent of cats developed re- obstruction of their stent—most of these cases involved ureteral strictures and not ureteral stones. Ureteral stent migration occurred in 6% of cats and stent exchange was required in 27% of stented ureters after discharge from the hospital. Temporary dysuria was also seen in 38% of cats at some point after surgery, and 18% of cats had persistent hematuria. The cats in this study did have signiﬁcant improvement in their azotemia prior to discharge from the hospital, and had an overall median survival rate of 495 days (range 2-1,262 days). 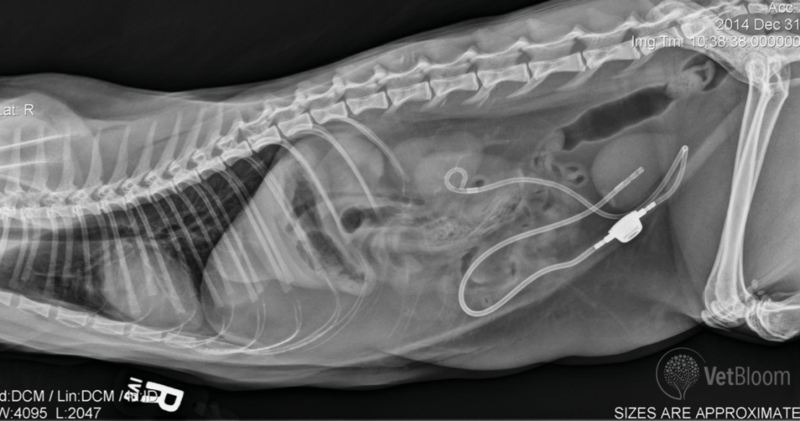 Recently, a new device called a Subcutaneous Ureteral Bypass (SUB) has been introduced to try and minimize short and long term complications associated with ureteral stents in cats. This device consists of an indwelling nephrostomy tube and an indwelling cystostomy tube connected to tubes that tunnel through the body wall and attach to a port located in the subcutaneous space. This device is placed with ﬂuoroscopic and surgical guidance. Since this is a relatively new procedure, information is limited regarding short and long term complication rates of the SUB compared to a stent or ureterotomy. In one recent study that evaluated stents and a smaller number of subcutaneous ureteral bypass systems, the SUB device was found to have a signiﬁcantly decreased risk of reobstruction compared to a stent, particularly involving cases with circumcaval ureters or ureteral strictures. Complications of subcutaneous ureteral bypass device placement include hemorrhage at the nephrostomy site, leakage of urine, obstruction of the SUB device with stones, or recurrent infection. Temporary dysuria can be seen in the ﬁrst few days post-operatively, but long-term dysuria is not a problem that has been commonly seen with the SUB device (as opposed to the ureteral stents). Cats who have a subcutaneous ureteral bypass need to have their ports ﬂushed every 3-4 months for the ﬁrst 1-2 years and then every 4-6 months thereafter to prevent encrustation and obstruction. Urine cultures can also be taken from the device port, and urine should be cultured every 4-6 months initially to help detect any occult infections. Cystocentesis should not be performed in these cats due to the risk of puncturing the SUB tubing. Urine sampling needs to be performed through the port with a special Huber needle to prevent the port from leaking. Post-operative management of ureteral obstruction requires very close monitoring. Many of these cases will develop a severe post- obstructive diuresis and need high rates of ﬂuids. Close monitoring of weight, blood pressure, urine output, central venous pressure and other parameters are required to prevent ﬂuid overload. The post-obstructive diuresis can last anywhere from several days to weeks. Cats are treated with post-operative pain medications and antibiotics. They are discharged when they are eating and able to maintain adequate hydration on their own. Prognosis is variable for cats with ureteral obstructions due to the variability in the severity of their renal values and clinical signs. Timing is important in resolving these obstructions with respect to recovery of renal function. Studies with ureteral ligation in dogs show 100% resolution in renal function if a complete obstruction is resolved within 4 days, and a dramatic drop in recovery after 7 days of complete obstruction. Intervening in obstructions sooner allows us to decrease the long-term damage to the kidneys. Full recovery of renal function may take weeks after severe kidney injury. Cats with ureteral obstructions may be challenging cases in terms of ﬂuid balance and electrolyte derangements. With careful monitoring and prompt resolution of the obstruction, these cats can do very well long term. Brady, a 3 year old CM DSH, was presented to the emergency service for acute onset of vomiting and lethargy. No history of toxins was noted. He had been previously healthy. On physical exam, Brady was quiet and alert. He had a painful abdomen and large left kidney palpated. Bloodwork revealed azotemia and hyperkalemia (BUN: 121mg/dL, Cr: 9.6mg/dL, K: 6.63mmol/L). An ultrasound of the abdomen showed hydronephrosis of the left kidney with a mildly dilated proximal ureter and a partially obstructive ureterolith (Fig. 1). The right kidney had moderate pyelectasia without ureteral dilation. The urinary bladder had a small amount of crystalline sediment. A urine culture was submitted and was negative. Brady was started on intravenous ﬂuids, antibiotics, pain medications and gastroprotectants. He was given prazosin and started on a mannitol CRI, but his hydronephrosis worsened despite treatment and the stone had not moved after 24 hours. Brady’s azotemia improved after receiving ﬂ uids, and completely resolved after placement of a subcutaneous ureteral bypass system (Fig. 2; BUN: 13mg/dL, Cr: 0.9mg/dL). Brady was discharged from the hospital and continues do well at home. He comes in every 3-4 months for SUB ﬂushes and recheck renal values. Fig. 1: Abodminal ultrasound images showing severe hydronephrosis of the left kidney (A) and resolution following placement of a SUB (B). Fig. 2: Lateral radiograph of a subcutaneous ureteral bypass system. Kyles AE, Hardie EM, Wooden BG et al. Management and outcome of cats with ureteral calculi: 153 cases (1984-2002). J Am Vet Med Assoc 2005;226:937-44. Berent AC. Ureteral obstructions in dogs and cats: A review of traditional and new interventional diagnostics and therapeutic options. J Vet Emerg Crit Care 2011;21: 86-103. Berent AC, Weisse CW, Todd K, et al. Technical and clinical outcomes of ureteral stenting in cats with benign ureteral obstruction: 69 cases (2006-2010). J Am Vet Med Assoc 2014;244: 559-576. Belanger R, Shmon CL, Gilbert PJ et al. Prevalence of circumcaval ureters and double caudal vena cava in cats. Am J Vet Res;75: 91-96. Lam NK, Berent AC, Weisse CW et al. Endoscopic placement of ureteral stents for treatment of congenital bilateral ureteral stenosis in a dog. J Am Vet Med Assoc 2012;240: 983-990. Berent AC, Weisse CW, Beal MW et al. Use of indwelling, double-pigtail stents for treatment of malignant ureteral obstruction in dogs: 12 cases (2006-2009). J Am Vet Med Assoc. 2011:238: 1017- 1025. Zaid MS, Berent AC, Weisse C, et al. Feline ureteral strictures: 10 cases (2007-2009). J Vet Intern Med 2011;25: 222-229.